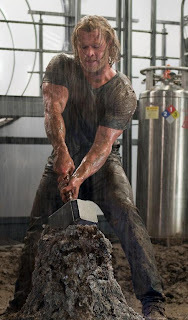 Thor may be exactly what we want from our summer blockbusters: rainbow-colored special effects, epic battles, sci-fi trippiness, mythological references, and just a little bit of beefcake. On all those fronts this movie delivers, even if it’s thin on human-centered jeopardy. The middle of a quintet of Marvel-funded superhero origin-story flicks leading up to an Avengers reunion (Iron Man and the Hulk reboot kicked off the multi-movie quest: the other heroes remaining to be introduced – Captain America and Ant-Man – are already in the works), Thor is a departure from the others, the only hero who isn’t a technological or biological freak of this world. Thor is the actual mythic Norse god of legend, and his arrival on Earth – when cast out by his father from Asgard – is neither questioned (why Norse mythology rather than, say Hindu?) nor is he given any more Earthly awe or glory than any average weight-lifting frat boy from Notre Dame. 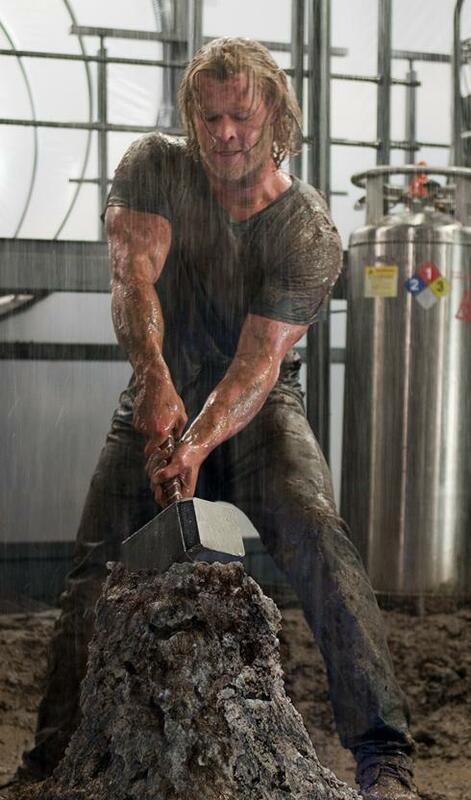 What Thor has going for him, however, is a mighty hammer, forged from the heart of a sun (when he learns the proper respect it’ll work for him again), as well as a frat-boy smile and showy pair of biceps that endears him with the local ladies (played mostly by a fawning and younger-than-Star-Wars seeming Natalie Portman). Not much happens on earth (other than the predictable mixed-marriage courtship – you know, I’m a dippy scientist, you’re a Norse god of legend, this will never work). Rather, all the interesting stuff in this movie takes place on Asgard, and the illustration of the Norse legend of Odin, Thor, and his trickster brother Loki. Thor’s Dad opens an Eisenstein Bridge (a wormhole to you and me, brought up on Star Trek lingo) and Thor pops onto Earth like a watermelon seed being spit out of the heavens. But what happens next hardly matters: Writer and director Kenneth Branagh was seemingly more intrigued with illustrating the background legendary family dynamics of warrior conflict rather than the busywork of moving around the mechanical backstory pieces of Marvel’s Avengers set-up (the S.H.I.E.L.D. squad, led by the once credits-relegated Agent Coulson, are now firmly anchored at the center of this story, as they haplessly try to diagnose what this god-like phenomenon is). Thank god, because what happens on Earth really should stay on Earth. The much more interesting action has to do with Loki discovering his heritage, trading with the Ice Giant enemies, and tricking Odin into transferring his love of one arrogant son to another. A smart decision, since while romping through Asgard and other Ice Giant battles, Branagh is able to largely avoid Flash-Gordon-style camp (despite those fabulous costumes) and give us an old-fashioned action, sci-fi yarn of merit. The story of Thor, then, is not so much the typical super-hero setup as it is the entertaining rite of passage of legend. Take an arrogant, war-happy, powerful youngster, strip him of his powers and his T-shirt, teach him a bit of humility, and make him fall in love with an Earthling and learn the value of life. This makes him a better King. As far as summer movie life-lessons go, it’s not a bad one. If only some of our recent Presidents had learned the same.